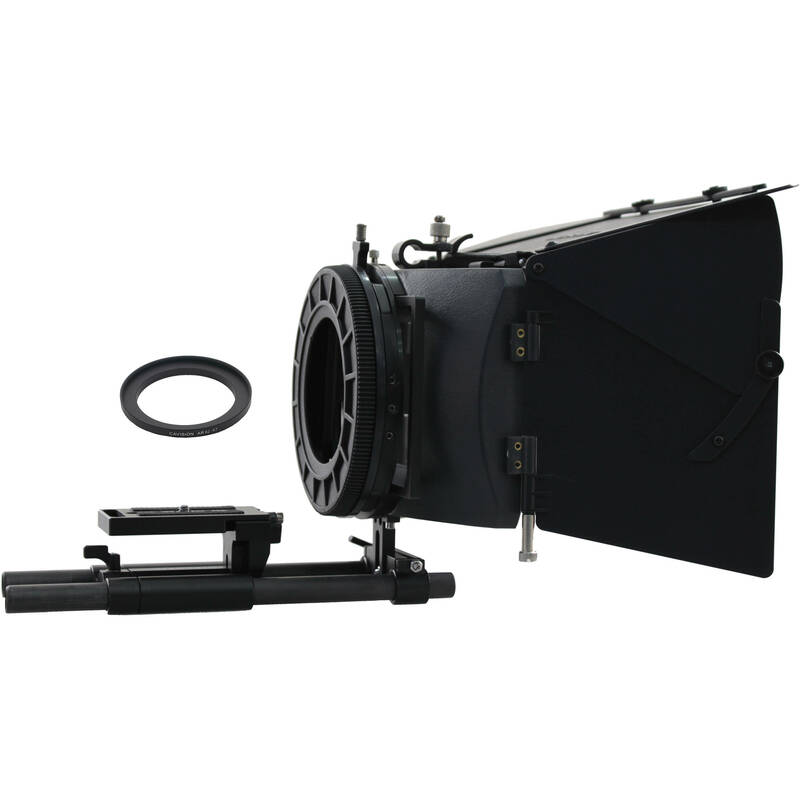 The Cavision 4 x 5.65 Matte Box Package is designed for use with the Sony NEX-FS100/700 Camera. It can be used for many other DSLR or hybrid (e.g. AF100) cameras with the addition of appropriate adapter rings. The package consists of a MB4169H-2M 4 x 5.65 hard shade matte box, ARR1385 85mm rubber back cover, AR82-67D10 67mm step-up ring, MBF-5PA Expandable Top French Flap, MBF-4SA Expandable Side Flaps, and RS15IIMQRB 15mm rods support with quick release. The MB4169H-2M Hard Shade Matte Box from Cavision is an ABS plastic rod-mount matte box with a 130mm rear lens opening. It features one 360° rotation filter stage, one fixed filter stage, two 4 x 4" metal filter trays, plus one 4 x 5.65" metal filter tray in the stationary stage. A 130 to 85mm rubber step-down ring is included. A Cavision rod-mount bracket and top and side flags are sold separately. The rod-mount bracket is required. Note: The 360° filter stages only rotate 270° when the matte box used with the Sony FX1 and Z1 cameras. The Cavision ARR1385 is an rubber adapter ring for MB4169H or MB413B series Matte Boxes; it adapts from a 130mm lens diameter stepping down to 85mm lens accessory. This Cavision 67-82mm Step-Up Ring enables the use of 82mm threaded filters on lenses with 67mm filter threads. The 10mm depth of this ring provides more surface area than a standard step-up ring. This provides a more secure grip to the clamp of your Cavision Clamp-On Matte Box. The step-up ring features a lightweight, aluminum-alloy construction that has a black anodized finish. This adapter ring features a depth of 10mm, providing a generous surface for a clip-on matte box to grab onto. The Cavision MBF-5PA is an expandable top french flag accessory for matte boxes and sunshades. French flags allow more control over production lighting; enables filters and lenses to operate with favorable results. The expanding and contracting system on this model features a better fit and collapsing capabilities for efficiency and portability. The Cavision MBF4SA is a pair of side flaps for both the 4x4 and 4x4.45 matte boxes. The side flaps increase the ability of the matte box to block unwanted light, preventing a multitude of optical anomalies, such as lens flares. The Cavision Rods Support is suitable for use with small cameras with short lenses such as mini-DV, 5DMII, or other DSLR cameras. It features a height adjustable front bracket for connecting a matte box. Filter Trays Two 4 x 4" and one 4 x 5.65"
* The 360° filter stage only rotates 270° when the matte box is used with the Sony FX1 and Z1 cameras. Box Dimensions (LxWxH) 9.2 x 7.35 x 4.35"
Box Dimensions (LxWxH) 5.5 x 5.5 x 0.1"
Box Dimensions (LxWxH) 9.1 x 6.4 x 0.9"
Box Dimensions (LxWxH) 10.2 x 3.75 x 3.45"
4 x 5.65 Matte Box Package for Sony NEX-FS100/700 Camera is rated 4.3 out of 5 by 3. Rated 3 out of 5 by Reese from Matte Box lite. I purchase this product to use as a second matte box for my B camera and as a shoulder mount for mobile shooting. I like the quick release feature for the camera and the way it aligns with the matte box itself. On the other hand, I find the matte box flimsy and the barn doors uncontrollable. The doors cannot be locked in place, so, should you lean forward the doors could move and get into the shot. Additionally, the doors are hard to mount on the matte box itself. The French Brow jiggles around a lot and can be heard on the sound track. When mounted on a tripod the rig is good and the doors are more easily controlled. Rated 5 out of 5 by Robert G. from Best choice This kit is perfectly well made, it is solid, and all it's parts fits as it should be. It looks great on my FS100; the rod system is a little bit short but enough when I'm using the camera with the Robinson lenses, I bought the follow focus too, and love it. In resume this is not my first time buying Cavision products, they're too good, looks great and it's price is affordable, the customer service is also really good. Rated 5 out of 5 by Luisalberto from Matte Box Package for Sony NEX-FS/700 Camera Very good and comfortable price. Does this have filter slots? and how does it work with the zoom lens? Chris, It's okay, first thing that happened is we lost a pin out of one of the hinges. The zoom catches on the rim a lot, and you have to watch it. There are slots for the ND filters. Haven't tried it with a follow focus yet.